Truth for Fiji - NO academic freedom and NO freedom of speech under Frank Bainimarama's dictatorship! 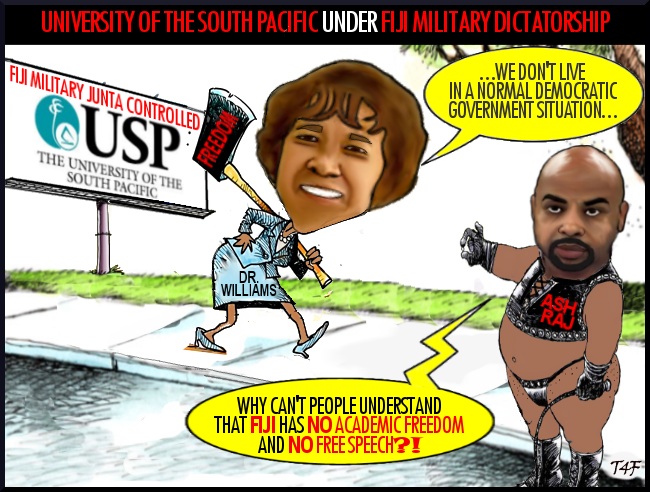 Dr Esther Williams and Ashwin Raj provide even more proof that FIJI has NO academic freedom and NO freedom of speech under Frank Bainimarama's dictatorship! Fijileaks reports that the University of the South Pacific has issued an ultimatum to Patrick Craddock of the USP Journalism program to sign a statement that would effectively silence him from talking to the media. Dr Williams's situation is not unique. It highlights a general sentiment across Fiji where most people are afraid of upsetting the criminal dictator bainimarama so they will do any say anything to appease him. if they dont appear to support the criminal dictator then they risk receiving a beating or some form of vengeance. So to survive the people lie to Bainimarama by telling him how wonderful he is and how much they love and support his corrupt leadership. MEanwhile, the people wait for the promised 2014 elections to show who they really support and want as their leader - and it is NOT Bainimarama and khaiyum.